A debut goal but Oshoala says: "There's more to come"
Asisat Oshoala bagged a goal on her Arsenal debut, but promised there is even more to come. The 21-year-old Nigeria forward moved from Women’s Super League 1 rivals Liverpool in the close season. And she took little time to settle in her new surroundings, scoring – having earlier hit the post – along with Danielle Carter and Dominique Janssen with Reading hitting back through Jade Boho-Sayo. 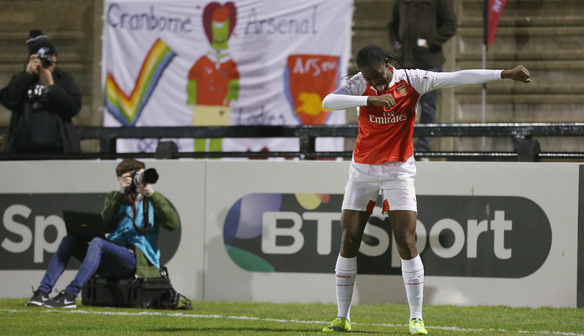 Despite getting off to a flying start Oshoala has told Arsenal fans: “you’ve seen nothing yet”. She said: “I had fun tonight. It was a very good start for me as an individual, getting to know my players, getting to know a new role. “I think it was a very good thing for me to grow into the game gradually. “I promise to give my best to the team. I want Arsenal to win a trophy, win every competition, win every game we play in this season. “I just have to give it my best in the training sessions and in every game give 100 per cent, this is a very competitive team. “You have to give your best every time, because we have a lot of good players. “Three points in the first game of the season is very important for us and very difficult as well, because it’s a home game against a new team and you don’t know the way they are going to play. Newly-promoted Reading saw their resistance broken on 33 minutes when Janssen drove at the Reading back four and planted a low shot beyond Grace Moloney from the edge of the area. Seconds after the interval Oshoala latched on to Carter’s pass and rounded Moloney before rolling the ball into an empty net for number two. Debutant Boho-Sayo stooped low to head Reading back into the contest, but Carter made the result safe when she nodded in a corner 20 minutes from time. Reading midfielder Charlie Estcourt: “We always knew it was going to be a tough game coming here, but although the result is not what we wanted, there are lots of positives to take from the performance. “We know what we need to improve on for the next game and that’s what we’ll focus on now. “We had some chances and we know in this league we’ve got to be more clinical. We are disappointed with the result, but it’s about building now. “We competed with Arsenal, who are going to be one of the best teams in the league. We know there are lots of tough games to come in the season but we think that we can compete and definitely be in and around all of the teams this season.